Several months ago, I was gifted a Boden catalog from a lady I work with. It was love at first sight! This clothing company has the cutest, most tasteful and wearable clothing I've seen in awhile. I love how there is an abundance of flat shoes and comfortable, yet stylish clothing with color! whenever I look at their catalogs or website. It's like real life, my life, stuff that was designed with me in mind. It inspires and makes me giddy. I received their fall catalog a couple of weeks ago and carried it about with me for a week for fear of someone stealing it while I schemed about knock-offs I could make for my own wardrobe. 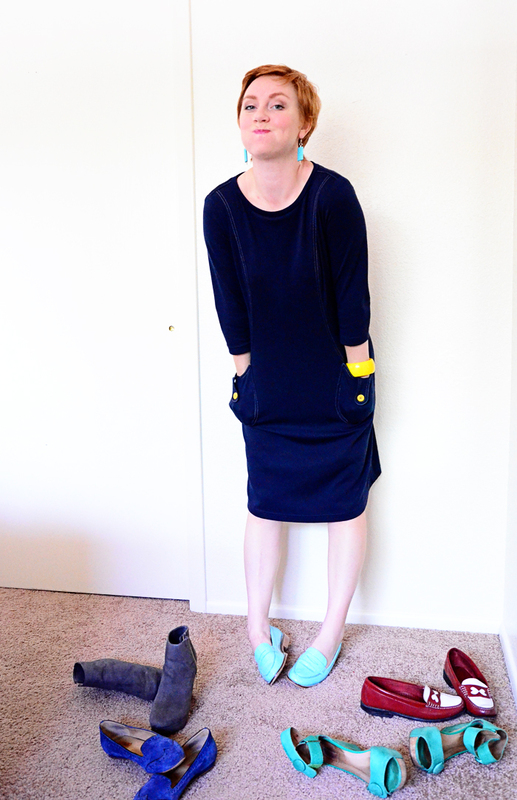 There was a particular ponte knit dress that caught my eye from the catalog. Oh so sixties inspired and oh so cute and yet, comfortable looking. Its a knit dress and that friends, equals comfort in my book. After mentally torturing myself that I didn't have the money to purchase said dress from Boden, it finally dawned on me that I had just the pattern and fabric to make my own version instead. 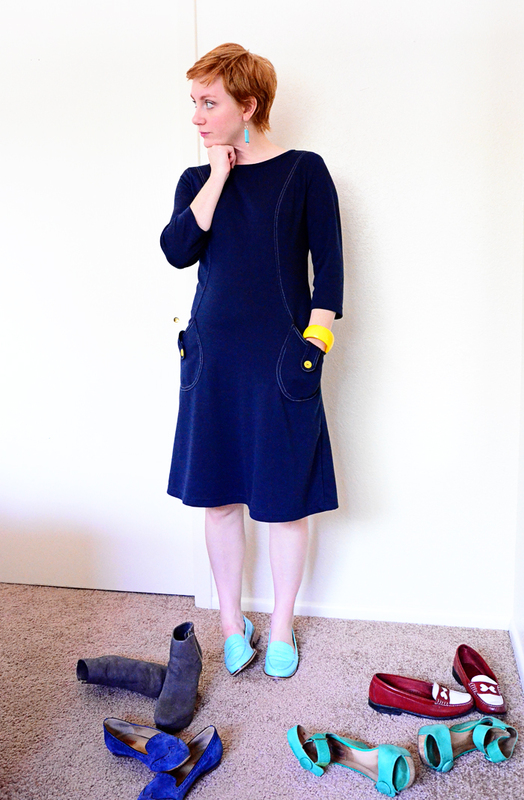 This is vintage 1960s Simplicity 8381. Isn't it awesome, I mean a gas? I scored this pattern from one of the ladies at Yellow Bird who was getting rid of some vintage lovelies. This one was a couple sizes too small for me, but I loved the design so took it home with me. Little did I know it was the perfect size for a knit! Yes! I love it when fate and fortune meet and end up with a happy snazzy result. I took the liberty of changing a few things about the pattern here. 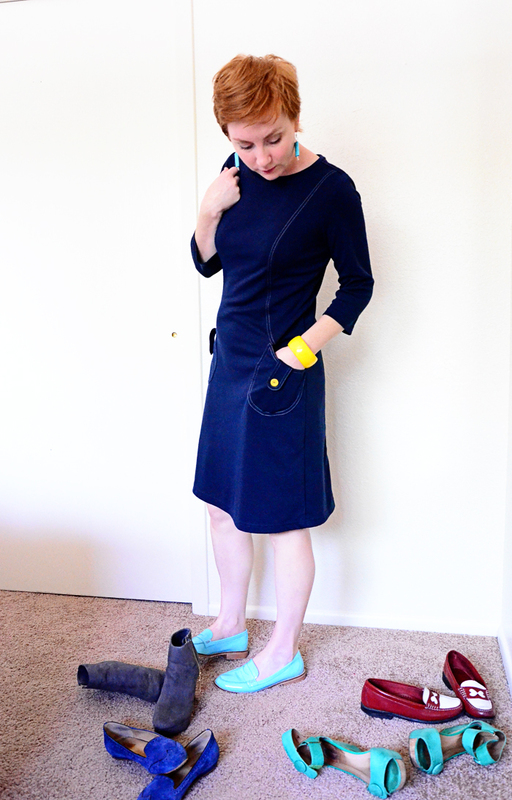 I hacked off the sleeve to make it 3 /4 length and turned the vertical darts in the back to a princess seam. Also chiseled out the neckline a bit and opted for a neckline binding instead of the facing situation the pattern had going on. As far as the fit is concerned, I just compared the bodice area to my favorite knit t-shirt pattern, just to make sure it was in the ballpark of where I needed it for a knit. And fantastically, it was. I made some small changes to the sleeve cap from my t-shirt pattern, but otherwise, this pattern is straight out of the envelope. Aren't those silly little pockets, the best? I think they make the whole dress and weren't even apart of the original Boden inspiration. I didn't have the heart to not include them. Additionally, I have to state, that this dress is full of mistakes. One thing I've found is that mistakes and risks can lead to creative solutions. All the frustration that comes from doing one thing when you should have done another can bear some interesting results. Could not be truer in this dress. The center back, that was going to be an exposed zipper. Well friends, that zipper didn't end up working like I thought, so instead I decided to improvise with an appliqued tab. I think the tab is a little on the long side - sadly it couldn't be any shorter because there's slashes in fabric from the zipper, but I still think it works. Same idea at work in the shoulder seams. 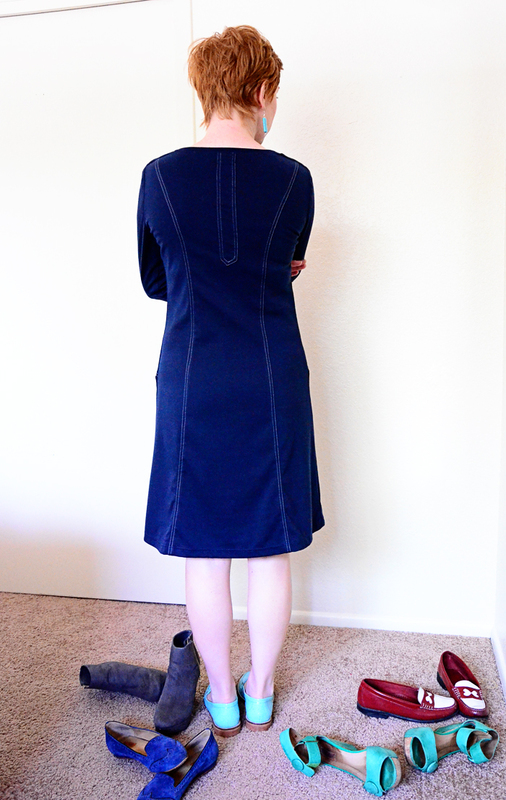 The princess seams from the front and back, though the middles match up, the topstitching lines do not. I folded one princess seam one way and the other in the opposite direction. So to fix this eyesore, I added applique strips and topstitched. Now that mistake is not quite so obvious and this ends up just looking like a fun added detail to the overall design. Hopefully this gives you some ideas as you sew. When working with mistakes, its always good to think outside the box or even get a second opinion from someone else. The fabric here was from the stash. Oiy. My stash is so big and so I've finally determined that I must be better about using it up first before even thinking about aquiring more fabric. This is a ponte knit and if you don't know about pontes, you should. Its a double knit and the way rad thing about double knits these days is that they are kind of like stretch wovens, except better. You can end up using them instead of wovens for woven patterns and just go down a size or two and they can be unbelievably comfortable. Pontes in particular are also easy peasy to sew with as far as knits go - a great transition from working with wovens to working with knits - and they can be easy to wash and care for. I think I'll do a special post on this great fabric for y'all! It's far too hot at the moment to be wearing such a dress (and this is the dress that I have to wear a slip with!) so it'll be a great addition the fall line-up in my closet. I really, really want a red one. We'll see. Do you like knit dresses? Ever heard of Boden? Ah yes Boden. I still have quite a few boden pieces although they are mostly too big for me now. But I have made skirts based on their designs. Little A lines with bias waists and hems. A shirt or two. Just gorgeous. Knit dresses are my favorites!! Your dress is absolutely fabulous ~ beautiful color and fit. Great job on those "mistakes". I would not have known that I could do that. I love double knits but can't quite distinguish between double knits or ponte knits yet. I've made the mistake of purchasing some awful knit (I think they're poly) that I thought were double knit. I liked the colors but the poly ugh. A post on ponte's would be great! I want more of this fabric in my life! I think the tab is fab! :) And the whole dress too of course, I LOVE knit dresses. That dress is darling and I love the tab down the back! I hope you get around to making a red one. Sunni, I love that dress!! It's even better than the inspiration and the topstitching really brings out the beauty of this one. The dress looks fantastic on you! Go for the red one! Very nice! Those pockets are so cute :) I love ponte knit for dresses. I made one for my Christmas day dress last year with a lace overlay, and another in about May that I have yet to wear. I feel the heat easily and ponte is much too warm for summer! It will likely get a lot of wear over this winter though- it's a beautiful deep plum-y purple/pink that I can't wait to wear! Love, love, love the dress. It's so you! And very 60's so much so I have to admit I had one very similar. But no, not a gas. More like, Far Out or Out of sight or Groovy! That's it Groovy. I have never heard of Boden, but spent a few minutes perusing their website through your link. Gorgeous clothing! I absolutely love your take on their shift dress! Funny though I originally thought your dress was velvet from the pictures... it just looks like it has such deep saturated color and a softness too it. I am going to have to check out Ponte Knits more... looking forward to your post about them. I absolutely love knit dresses and made myself three last year and I agree about double knit, it's just lovely and so comfortable to wear. I think your knock off dress is actually better than the Boden original, especially with those princess seams and pockets, PLEASE make a red one! I've just discovered Boden too, but can't bring myself to cough up their prices. I'm seeing a lot about ponte knits in the blogsphere lately. How is that pronounced? Point? Pon-tey? Never am sure! Such a cute dress!! looks really nice on you and you managed to hide those accidents very well. they look like design elements :) Thank you for mentioning Boden. I knew about them but never paid enough attention...until this morning. They really are gorgeous! May i ask you what brand are the turquoise/aqua shoes and sandals? love the colors oh so much! Great use of ponte, and I think the yellow buttons are perfect!! 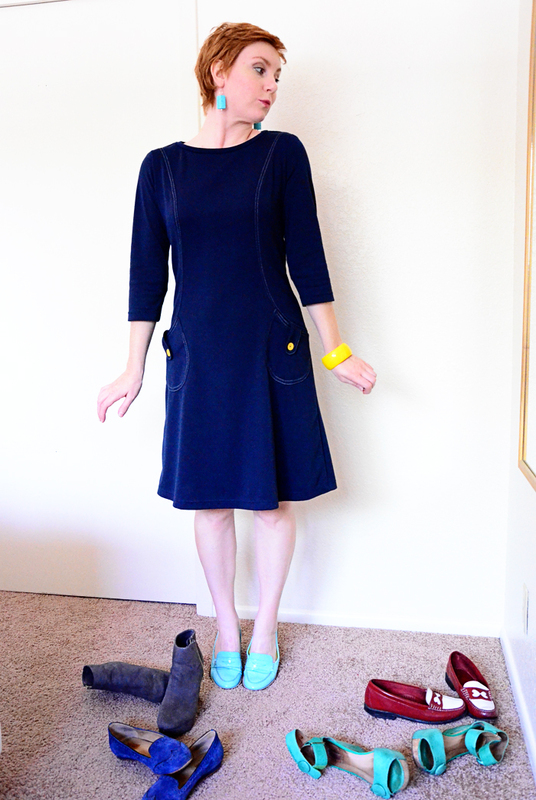 Adorable dress - I especially love the yellow buttons on the pockets. And your styling is so cute! I just died when I saw those pockets and all that topstitching. Must knock off your dress IMMEDIATELY! Boden catalogs got me thinking about sewing my own clothes--LOVE their styles but not their prices. Bloggers like you keep me inspired. Cute outfit, and I really enjoy your posts. Must buy more colorful shoes! I love this dress, it looks so perfect and fun. An amazing job as always. Sunni, you are hilarious! Yeah, other than 5 changes, it was the pattern right out of the envelope! This is so cute! I love what you did with the methods to deal with your oops moments. Very clever, very clever, they do look like design elements. Yes, do a post about ponte and any tips you have about sewing with it. I will have to locate a Boden catalog if they have flat shoes. Adorable! I love Boden. It's the inspiration for 99% of the clothes I make. I found them several of years ago because they had the nicest maternity clothes steeply marked down right as I was quickly expanding in the waist. I can't wait to see what else you come up with from their inspiration. I know what you mean about Boden, I have lot of love for Boden, too. When the catalogs come I always keep them around for lots of perusal. I love Boden too! An English friend introduced me and it has been love at first sight. Your dress is adorable and you are right, your 'mistakes' have turned out to be "Happy Accidents" (remember Painting with Bob Ross?) Love it! Yes and yes! The first time I saw a Boden catalog I felt the same way. I often search their website for sewing ideas, especially for pattern and color ideas. Love the topstitching, love the design, love the photos. Well done Sunni. Red would great! It's beautiful. 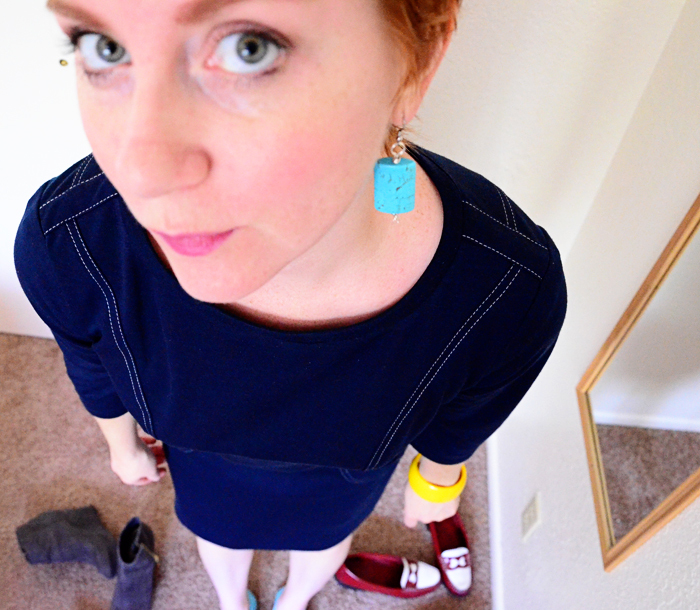 I love that color on you and the contrast yellow button and bracelet are awesome. Off to look at the boden site now ('boden' here in Australia is European glassware XD). Very cute dress and it looks great on you! I would really appreciate a post on ponte/double knits. One thing I would like to know is whether ponte knit and double knits are interchangeable terms, or whether a ponte knit is a particular kind of double knit. I like the inspiration but I love your interpretation, so much personality. Happy Accidents indeed! I never would have known; but, better than that, I think your version is cuter than the original--all that topstitching really gives it character. I love Boden! Their clothes are so cute. But I think your dress is much cuter than the one from Boden and good job on using some of your stash! I have that exact same picture ripped out and on my bulletin board! Love your dress; it's super cute, and your shoe photos crack me up! This dress is oh so Boden-like... I love their designs and you did a great job. I use their catalogues as inspiration too, because buying a piece from them is more like "investing". Your version is even better than the original with that pockets and topstitching and I looooove that colour! I love Boden, too, but have never ordered because 2 women I work w/ shop there. I do love the catalog for inspiration, though. Cute! Love the details on this dress. I really envy your ability to just try something out & make it work. Amaze (also...love the turqouise shoes!). What a fantastic dress! Love the buttons and the tab for the zipper. :) I'm also a Boden fan. That dress is absolutely adorable! Love the pockets especially, and that you used contrasting buttons (although they're big enough, I can't see if you did your 'signature' contrasting thread on the buttonholes, lol). Looks so fun and casual and easy to wear! I love Boden, they're one of the few RTW brands I will buy from these days. I happened upon their catalog by accident a couple of years ago and it was love at first sight too. Some of their stuff is quite pricey, but I find they end up having LOTS of sales (and not just with one random remaining size), so if you're patient you can often get something much cheaper in a month or two! I've been very impressed by the quality, too. Sunny - this is such an awesome dress on you! I love the pockets and the topstitching. BTW, I love, love, love ponte knits. They are the absolute best to sew with and make terrific garments. I also check out the Boden site, not as much as some others, so you've reminded me that I need to go over there and see what's going on for fall. Ah yes!! I've been a devoted Boden fan for years. And to those that lament their prices, sign up for their emails and they'll alert you to their sales. I never pay full price for their stuff. They often have 30% off plus free shipping! And you think their women's stuff is great, check out their kids line. ADORABLE (and more affordable I think). Anyway, enough about Boden. Fantastic take on that dress, Sunni! I love your version. LOVE it! It looks so comfortable, something you would actually want to pull out of the closet and put on. Yes, I pour over my Boden catalogues for inspiration, too. Haven't acted on it yet. The only person in my house who's had Boden on their skin was my firstborn - a few special shirts for his birthday. With a few more kiddos now, though, I don't cough up that kind of money for boy shirts. 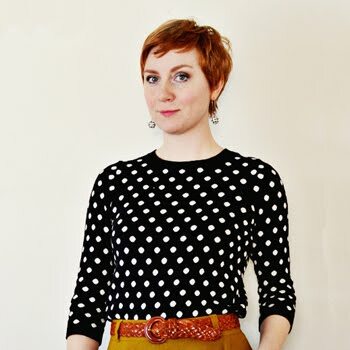 Boden - now there's a post series to add to your blogging queue request. 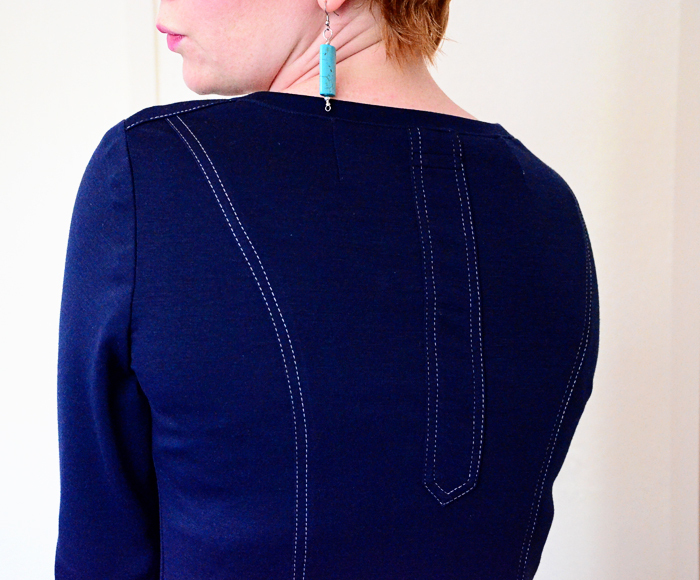 I really love the pockets and the stitching on your dress, it looks 100x more interesting than the Boden version! The joys of making your own clothes! Great dress. I did the same thing with the fall catalog. I have some of the pages pinned on my board for things I want to make for fall. I LOVE Boden catalogs... but I am plus sized and they don't carry those sizes. I keep telling myself that I will lose weight and the first thing I will do is buy a Boden item. Why didn't I think to sew something similar? Thanks for the inspiration... but even more, for the better than inspiration item. Your dress is so cute and so you!! I love it more than the Boden one. And I loved how you addressed your mistakes. I probably would have given up. Hi Sunni! I am a lurker here, but have decided to stop that and start commenting more. I couldn't help myself after seeing this terrific take on that Boden dress. I like yours so much more! 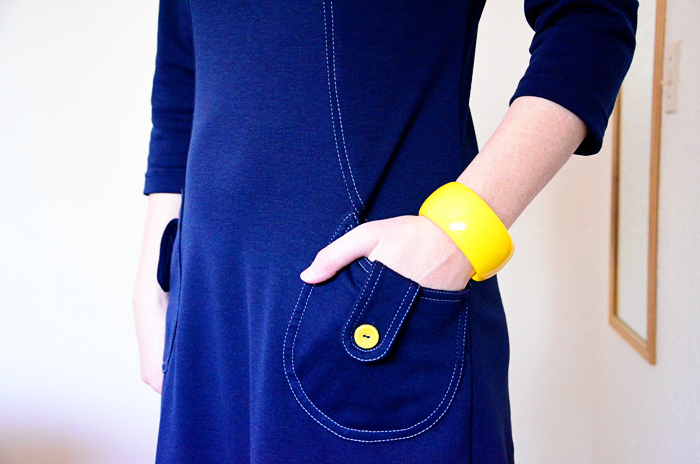 Creative solutions to what you thought were mistakes, those cute pockets, the topstitching! Love!